Celebrity Extra: I watched the premiere episode of “The Gates” and I absolutely loved it. Having seen it, I can tell that it is a wonderful, unique idea for a series. However, how would you describe the show to potential viewers, especially those who are wary of “another vampire show”? Luke Mably: "The Gates" is primarily a drama with supernatural elements, set in and around a gated community. But as we dig deeper, not everything is as it seems. There’s a mix of strange occurrences, characters not who they appear to be, nonhumans trying their best to blend in, ‘humanize themselves’ if you like. In some ways, the place is a hideaway or retreat, a vessel for them to survive - and yes vampires are a part of that. The majority of the residents have no idea this is going on. As the season unravels, audiences will be in for a few surprises as well. There are secrets and lies and numerous things that you would not expect from such a majestic surroundings. I understand there are a number of vampire shows and films out there at the moment, but vampires will not be the only creatures lurking behind the walls of The Gates. 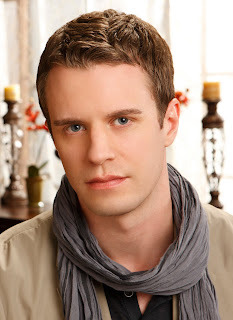 CE: What drew you to this series, and to the part of Dylan Radcliff? LM: My agent sent the pilot script to me. I had been reading numerous pilots; it was that time of year. Some are better than others as you can imagine, and ‘The Gates’ definitely stood out as one of the good ones. The concept was interesting to me. It was intriguing. The story made me keen to know more, and that’s always a good thing. Two days later I was in the casting director's office in London, being put on tape. I originally read for Nick Monahan. The producers liked me and asked if I would go on tape again but read for Dylan Radcliff. “What, the vampire?” I thought, “Nice one … I haven’t played one of those before.” Anyway, through a process of tests and trying out different accents – I was thrilled to be offered the role of Dylan. CE: I like that Dylan isn’t a “cliché” vampire: He is a loyal husband, businessman, and especially a father. Everything he does is for the love of and to protect his daughter. Is that protectiveness and “human”-ness something that appealed to you? LM: Absolutely. It gives me a very clear overall objective with being Dylan. To protect my family, to protect my child at all cost, unconditional love for another. LM: The cast is great, as are all departments on this show. A lot of my scenes are with Frank Grillo, who plays Nick. He is a fantastic actor to work with. We hang out off-set and try to rehearse the material as best we can within the short time period we have. We look out for each other and I like that … sort of like a brother. CE: I don’t know if this is addressed later on or not, but why does Claire have such trouble with her cravings, more so than Dylan? Is it similar to how alcoholics/drug addicts individually deal with their cravings? LM: Yes, there are similarities. Dylan has clearly adapted to the lifestyle of The Gates more than Claire. This is a new life that he wants his family to invest in, a safe haven. Again, protecting his daughter is everything to him. If he ever started feeding/killing and going back to his old ways, then there would be dire consequences. They both know this, but evidently Claire’s cravings are taking control of her. In episode one, Dylan says to Claire, “I get us all the blood we need from the lab!” in reference to the biotech company he runs. The idea is, he brings home bags of plasma for them to get their daily hit of blood. So why would Claire feel a need to feed and kill? I think the fresher the blood, the bigger the high. CE: I think people who know you from “The Prince and Me” are going to be surprised to see you in this role, especially the scene where you had to make that man’s death looked like wolves did it. Are you excited to get fan feedback about this role? LM: I hope they enjoy the show, yes. You know, when "The Prince and Me" first came out, I was staying in Los Angeles. I remember walking down Sunset Boulevard and someone saying to me, “Hey, you’re that Prince guy!” Then the same week, I remember going into meetings for film roles and when I walked into the room people would go, “Ah ... the prince!” It was nice to get recognition for a role I did, and I know, since then that fans of the film have been very complimentary, which I am forever grateful and sincerely humbled by. But as time went by, and knowing how high-profile "The Prince and Me" was, I thought, I hope I won’t be known only for playing this prince guy. So I was keen to do more diverse work. I went back to London. One project I am proud of since then is a play I did in London called "Festen." I played a man who was, along with his twin sister, sexually abused by his father and who decides on his father’s birthday to reveal it all to the family. It’s a haunting story and subject matter. It was originally a film, a great film. Another project I’ve done, which I am keen for people to see, is a movie called "Exam." (It’s being released in the U.S. on July 23, 2010, but you can get it on DVD in the U.K.) It’s set all in one room. The description is: "Eight talented candidates have reached the final stage of selection to join the ranks of a mysterious and powerful corporation. Entering a windowless room, they have 80 minutes to answer one simple question. The test supervisor outlines three rules they must obey or be disqualified: Don’t talk to him or the armed guard by the door; don’t spoil their papers; and don’t leave the room. He starts the clock and leaves. The candidates turn over their question papers, only to find they’re completely blank." I play this narcasistioc type who is very loud and brash and ruthless in his intent to win. It was one of those roles that I got very absorbed in. I am always interested in mixing it up. That’s what interests me as an actor. CE: What attracts you to a role, in general? LM: Anything that moves me and challenges me. Something I can get excited about. CE: I read that when you were preparing for “The Prince and Me,” you had mastered a Danish dialect, but then they decided you should just use your own. Have you had the chance yet to show off your Danish accent? LM: No, I haven’t. There’s a part of me that still wishes I could have done that film with a Danish accent – it would have been more authentic. But on a commercial level I can understand why they didn’t want it. CE: Also, are you glad you get to use your own dialect for “The Gates,” and not have to do and American one, or do you find it fun to deal in different dialects? LM: I don’t really have a preference, but if an accent is appropriate, I like to do one – if anything it’s a useful thing to hide behind. CE: Do you know if “The Gates” is the kind of series where if it does well it could be picked up for the fall, or is this the beginning of a new trend of all-new summer series? LM: I’m still learning how it all works. Yes I think if it does well, it could be picked up in the fall. CE: Your introduction to American audiences was in the horror/thriller “28 Days Later.” Being a horror fan as a child, was it fun for you to be in that movie? LM: I loved doing that movie and being part of that story. Danny Boyle is a very interesting director. He has wonderfully inventive mind. CE: I rented “Colour Me Kubrick” a few years back and loved it. How was that movie to work on, and to work with the great John Malkovich? LM: John Malkovich was awesome to work with. He had been an idol of mine while at Drama School. He's an inspiration.